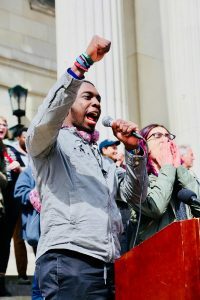 With just two weeks to go to until the 50 Miles More Massachusetts march from Worcester to Springfield, we are posting another blog written by the student organizers. The march will be held August 22nd through August 26th, with a rally outside of Smith and Wesson at the end. The entry below was written by Trevaughn, an incoming freshman at Hartwick College. “Setback? That’s not a setback. Smith and Wesson not meeting with us…it’s simply a mere inconvenience. Solving problems has always been my job. From freshman year in my Model Congress team to senior year as student council president, it’s been integrated into my life every step of the way. With over 150+ mass shootings in America so far, and a quarter of them being located in schools, institutions of learning,is ridiculous. Mass shootings aren’t an inconvenience. It’s a problem. It’s now turned into an epidemic. Lockdown drills weren’t a thing at my school until the March for Our Lives rally we held in Springfield, where students called out schools out for not having any drills or safety preparation classes. That’s the change that I hoped for. Now I want something bigger. Red flag legislation, comprehensive background checks, closing glaring and frequently exploited loopholes regarding gun purchases, all those things I fight for, every day. I’m marching because each student that died had a future. They had loving parents. They could’ve gone to college. I’m marching because I don’t want my kids to experience the fear of dying in schools.